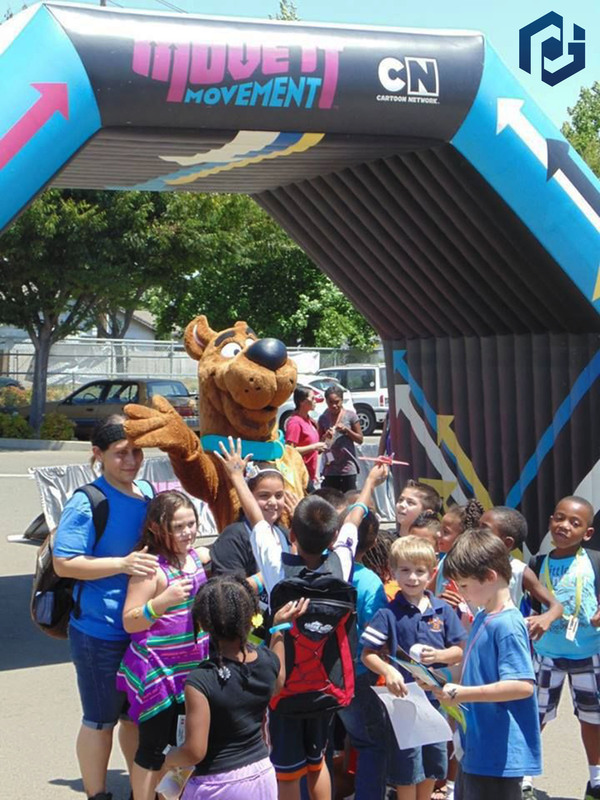 Cartoon Network wanted to get something really special for their Move It Movement, which was an interactive tour that promoted health through fun exercise. They decided to go with a vibrantly designed inflatable marketing arch that really popped. 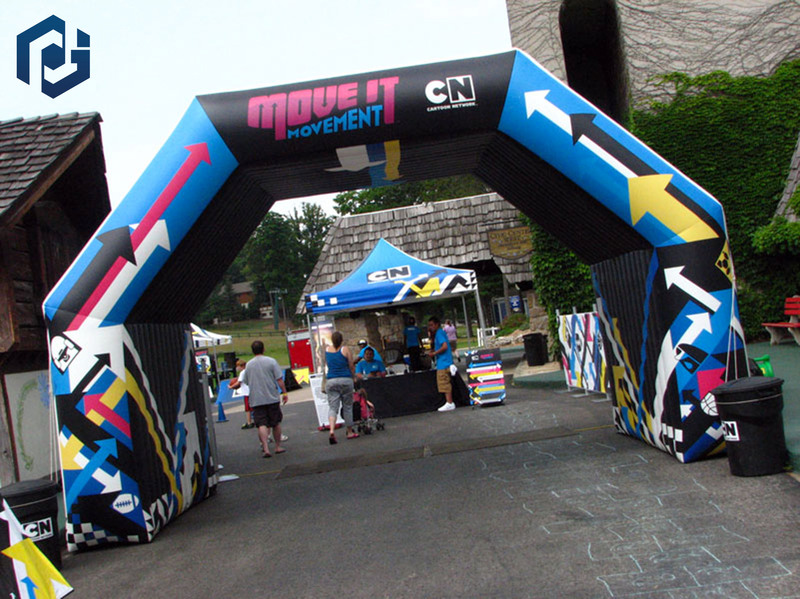 Cartoon Network decided to also get some matching pop up tents. This super customized archway was fully printed with a modern, abstract arrow design throughout. The bright colors of the arch and tents could be seen from afar, with distant chatter and sounds of children playing. The overall set-up was a massive success that attracted throngs of people from all over. 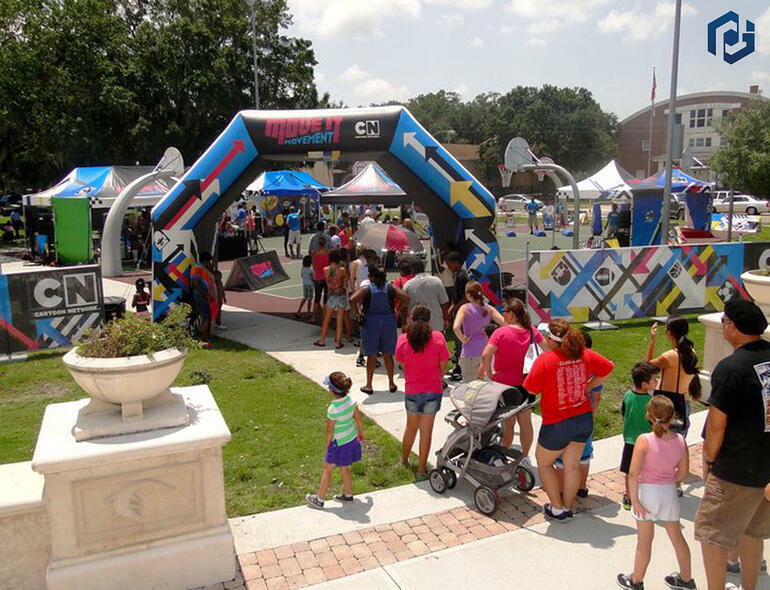 This inflatable marketing arch was designed to attract people and be sturdy, and that's exactly what it did. Curious kids and adults from all around the neighborhood could see the vibrant colors. Thanks to our high quality digital printing process, we were able to print all the excellent graphics that Cartoon Network provided, with high accuracy. Since this arch will be on the road, it will be constantly set up and taken down. With that type of usage, you need something tough and commercial grade, which is the only way we make them here. If you're going to invest in serious marketing material, you want to make sure it's going to last you years, and our warranties speak for themselves. When it comes to creating something that is fun and interactive, we like to take it an extra step further. Looking to play some games with your guests? We've made interactive games in the past that involved padded chip suits with helmets and a soft ball blaster. People would put on the suits and get into a formation. They would only be able to walk side to side and they would have to avoid getting hit by a soft plastic ball. If they got hit, they were eliminated. The last person standing would win the game and get a prize. We have also created a bouncy wall platform where people wearing Velcro suits would jump and stick onto the wall. The one that would achieve the greatest height would win. At Promotional Design Group, we can create all kinds of awesome craziness. Custom inflatable arch, built to last. Lines of excited people, included. Want to create the unimaginable? Infinite ideas are just waiting to come into existence. Let us come up with some together.